"I just graduated from Towson University with my Bachelors in Vocal Performance. Next year, I'll be pursuing a Masters of Music as a member of the Maryland Opera Studio at University of Maryland. I'm super excited!" "I started singing in choir in elementary school and stayed with it until my senior year at Towson. This year, I performed in Le Nozze di Figaro and had to put most of my focus on that music. I knew I wanted to be a singer since I was a child, so being in choir was a huge part of my musical development." “I have so many! I think I'm currently living my favorite musical moments right now. Performing Countess Almaviva in Le Nozze di Figaro​ was an absolute dream for me and something I was told I wouldn't get to do until I was much older. I loved stepping into her life and getting to tell her story. It's extremely fulfilling as a musician and actor." "Brahms has always been near and dear to my heart. One, because his music is undeniably beautiful and two, because he was so good to Clara Schumann and I love their entire friendship. I'm pretty invested in the lives and drama of famous composers, so Brahms is a good guy in my book. But when it comes to opera composers, I've got to give a shout out to Massenet, Verdi, Puccini, and my man Mozart." "I almost said Beyoncé, but then I remembered that Lady Gaga exists. So Lady Gaga. Why? ...because she's iconic." "I'm kind of obsessed with the opera Tosca by Puccini. My all-time favorite piece is Scarpia's aria in the Te Deum scene. I think it's perfectly composed and the text is so powerful. I love the contrast between Scarpia's lust for Tosca and the Mass unfolding behind him as he sings of love in the house of God. It's intense." "I've got to say, I've never thought about meeting either of them. They're both great, hilarious people... I guess I'll pick Jennifer?" “I would do community musical theatre shows. I performed with Rockville Musical Theatre in their productions of Gypsy, Hello Dolly, and West Side Story. It was so fun, and I learned a lot about performing from watching the adults in our casts take on leading roles. It also was an easy way for my parents to keep me busy on a budget!" “The Redskins, I guess. My dad's family had season tickets to their games and I used to go with my dad once or twice a season. I love those memories and so I think I'll always be partial to the Redskins." “I'm a pretty good thrift shopper. I find unique pieces and amp them up. No one would ever guess they're from the thrift shop. I've even found recital gowns for $20." Erica Ferguson is a graduate of Towson University with a Bachelors of Music in Vocal Performance. 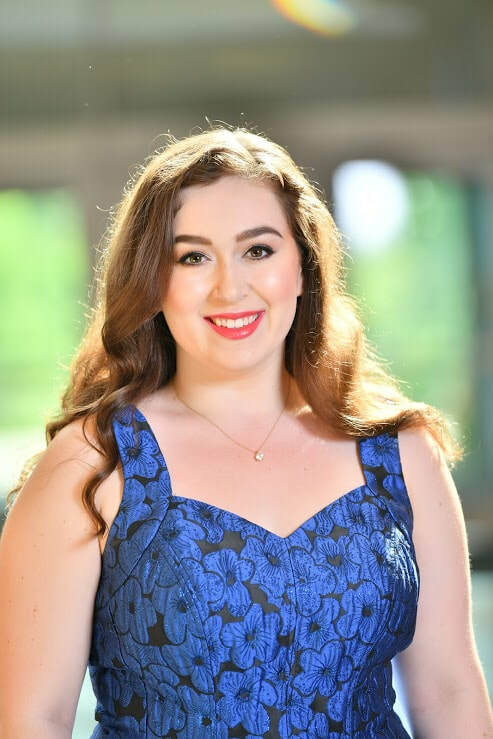 This Fall, she will be pursuing her Masters of Music as a member of the Maryland Opera Studio at University of Maryland. With aspirations of pursuing an operatic career, much of her performance experience has been in opera. She was seen in Towson's productions of Le nozze di Figaro (Countess Almaviva), The Old Maid and the Thief (Laetitia), Gallantry (Lola), and Suor Angelica (Una Conversa) as well as opera outreach performances of The Billy Goats Gruff, Sleeping Beauty, and Cinderella at Annapolis Opera. Erica has been a member of Towson's Chorale and Women's Choir, traveling with them on their Mid-Atlantic tour in 2015.